Four days long Gdansk was under the influence of infoShare, with the main attention focused on the two days’ conference on the 17th and 18th of May 2017. Over 6.000 people attended the biggest tech conference in the CEE region. I had the honor to host the Inspire stage. I was thrilled by the quality of speakers we had on stage. Summarizing what all has been shared is close to impossible; below you will find some of the highlights of the Inspire Stage. Several speakers mentioned impressive numbers proving that technology keeps developing at an amazing high pace. This offers many opportunities, but at the same time challenges as well. The role of the entrepreneur is a very important one, but not as important as many might believe explained @gregslamowitz, writer of the book “Flip the Pyramid: How Any Organization Can Create a Workforce That Is Engaged, Empowered, Aligned and On Fire!“. Entrepreneurs will have to realize they are not the smartest person in the room, that it is all about employees and then clients, but not about themselves. @robinwauters showed us that the current investment climate in the EU is rather healthy and investments have increased year-on-year. He concluded that there is a major difference in between the US and the EU noticeable. The majority of the investments in the EU are related to acquisitions of companies once they have become successful and need to scale, there is less early stage investment money available in the EU. There’s a Fantastic Four of new key technologies you just have to know about: the cloud, cognitive computing, blockchain and user experience. All these innovations provide many opportunities, but how to make that young and old can benefit from it? We will have to be sure that technology is relevant for people and that we take care about the user interface (UI). And this was not only mentioned by @iammobilebob. AI is increasingly the new UI, but demonstrations showed it is still far from flawless. Catching up with these technological developments in the traditional linear way is no longer an option, it’s just too much too handle mentioned @BalzerSB. We need different management practices, organizations will have to rethink their structures and set the right priorities. At the same time jobs are at risk showed Marcin Hejka. Artificial Intelligence (AI) is already making regular jobs redundant, humans are being replaced by “machines” and this time no job level is being saved. We are moving into the era of intelligent enterprises. They will be more productive than ever before and technology changes the way we are organized. Jacek Borek of @AccentureTech showed that based on Accenture’s 2017 Technology vision, which you can download here. With the increasing amount of online activities we will need reliable and secure payment methods, which @vilashpoovala shared with us. These methods should be easy to use by the client, which currently too often is not always the case. A completely different challenge we are facing is our food chain. Due to natural disasters, a growing society and environmental challenges, we must rethink how and what we eat. Trend analyst @hatalskacom took us on a journey into the future and what our food might look like. One of the drawbacks of technological innovation is the amount of information we handle. Daily we take 35.000 decisions, which results in decision fatigue. When designing new solutions, we need to take this fact into account and we should design the UI in such a way that it works for people. Predictive analysis, based on many decisions made in the past, can lead to an anticipatory experience as @heathriel explained to us. The Gdansk public transport organisation ZTM announced a new program disclosing a lot of available data regarding the transport in the city. Developers are invited to develop applications that will support the transport effectivity and efficiency of the city. Due to the speed of change, we need to adjust our organisations to be able to benefit from technology and this needs guts, you need to dare to cross the line that indicates the current state as @vulicvladimir showed based on a powerful red deer example. These Czech red deer still do not cross the no longer existing “Iron curtain” boarder, although none of them has ever experienced it. More about this example in my post “Better sorry than safe“. We should realize there are many contact moments that we can utilize a lot better and @brian_wong thought out a way that his company is utilizing now. Among others based on his book “The cheat code”, he challenged us to be inspiring, to think big by presenting moonshots that will challenge others. How to get noticed in this overwhelming information age where everyone is generating loads of content: by remaining human and supporting our advocates explained @markwschaefer, author of “The Content Code: Six essential strategies to ignite your content, your marketing, and your business”. The room was completely packed when @paweltkaczyk took the stage and explained us how machines might cheat us in the future. Maciek Orłoś learned us how to improve our personal speaking skills, among others by timely shifting our gear, the right interaction with the audience, etc. @MaciekOrlos has created an alphabet where every letter stands for certain behavior/actions a speaker should consider. Francoise Lamotte (@franlamotte) told that the insurance industry will have to become more customer oriented, among other thanks to technology this is possible. Sujan Patel explained us how to build a personal brand by sharing and creating valuable content. It takes dedication, but then you will be able to move mountains. It was energising and stimulating to hear how Michał Szafranski produced his own book, well done. By showing how he did it, step by step he showed the audience how you can manage your promotion by yourself at low cost. We often do not realise the complexity and challenges organisations are facing to provide services to us. Skip Haffner shared what it looks like in the aviation industry. How to catch the moon was according to Maciej Budzich (@mediafun) and @jakubgornicki their craziest title ever for a session at a conference. They shared several available multi-media tools that can support to tell your brand story. Last but not least, Michał Sadowski (@sadek) showed in 10 steps how to build a brand and explained the audience how important it is to measure the results of your activities. Having your startup is not like lying on the beach & drinking a cocktail, it means working hard and a lot of dedication. Special thanks to Bartek for the beautiful musical support during these two days! The key summary for me: Technological innovation has an amazing potential, but unfortunately, too often we take too little care about the user interface. This causes that it is hard, especially for the older and younger generations to fully benefit from it. In addition, organizations will have to change rather dramatically to benefit from these technological opportunities. It is about being disruptive or be disrupted. 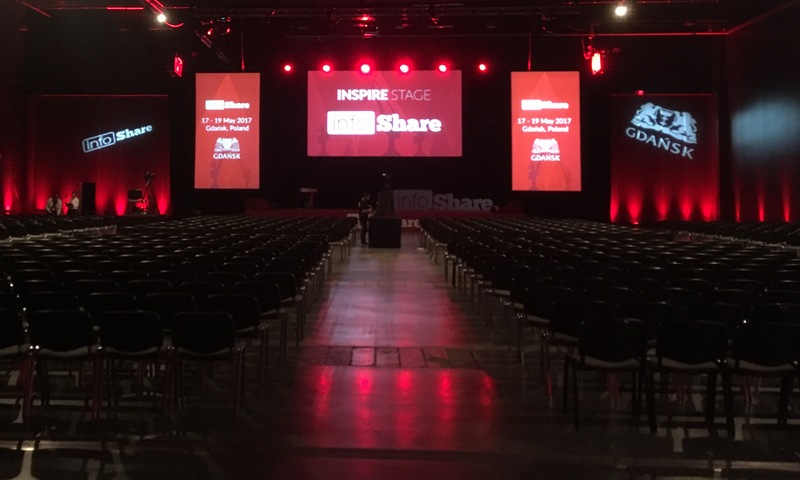 What we could show on stage was only possible thanks to the willingness of the speakers to come to Gdansk, the support of many volunteers, the help of the audio/visual team, security team, the cleaning service and the infoShare team. Thank you all for your participation! Thanks to the audience and especially the people who dared to leave their personal comfort zone by asking questions during the Q&A sessions.